Training Model for Laparoscopic Common Bile Duct Exploration. Impact in the Improvement of Surgical Skills. 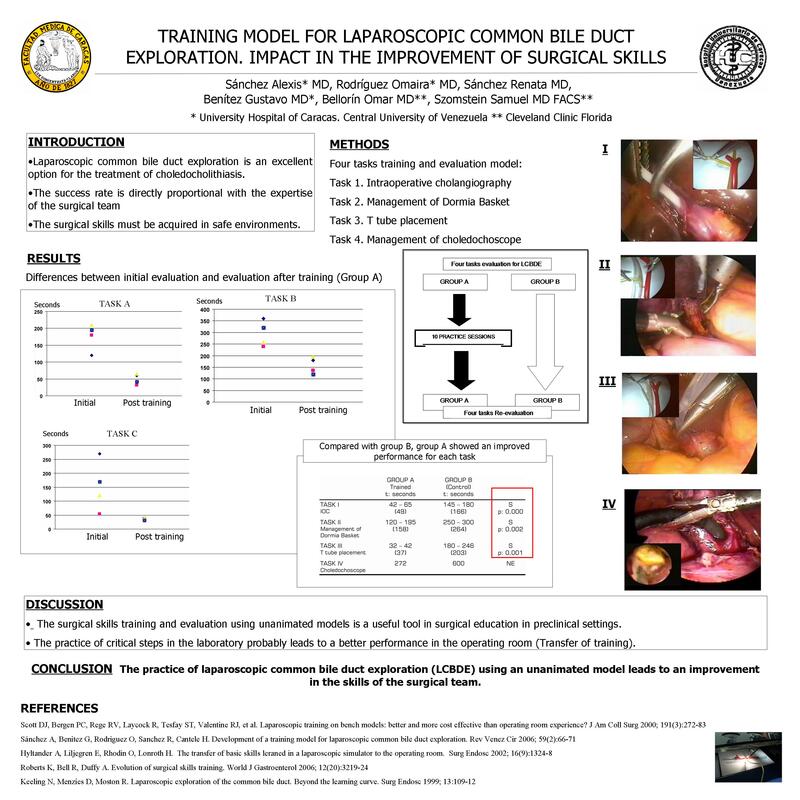 Objective: To measure the improvement of surgical skillsina training model of laparoscopic common bile duct exploration. Methods: This is a prospective, comparative, controlled study. Eight subjects ( PGY5 ) were evaluated and divided into two groups, group A and group B (four PGY5 each). Both groups were evaluated in the following tasks: cystic duct cannulation for intraoperative cholangiography (IOC), management of a Dormia basket advanced trancystically, T tube placing, and management of a choledochoscope. During a two-week interval, group A performed 10 practice sessions. Group B did not receive any prior sessions and was compared to group A before and after the sessions. Results: Inicial assessment of both groups did not show differences between them, which demonstrates that they are comparable samples. Compared with group B, group A showed an improved performance after the practice sessions, making it clear the positive impact in training skills using this model. Conclusions: the practice of critical steps in laparoscopic common bile duct exploration using an inanimate model leads to an improvement in the skills of the surgical team. This improvement probably leads to a better performance in the operating room. Key Words: Laparoscopic common bile duct exploration, training model.